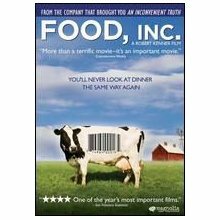 If you care even the least about what you put into your mouth, please watch this documentary. Not really much more I can say, that isn’t quoted at the end of the film. It’s really disturbing to see how “big corporation” has changed the way we grow/produce our food. Especially with regard to our meat. Go to the official website and look around while waiting for Netflix to deliver, or your next visit to Redbox to get this movie. This entry was posted in Food, Video and tagged Food Inc, Organic. Bookmark the permalink.